Rimmel Stay Matte Pressed Powder-Ever since seeing this powder making an appearance in many a Tanya Burr tutorial, many of us rushed out to purchase it. This powder's crazy affordable and if you're prone to looking a bit sheeny shiny, then Stay Matte belongs in your life, and your handbag. I have the transparent powder and it never adds additional colour to my face. It also doesn't apply cakey and leave you with a chalky looking complexion. I'm not overly keen on the Grandma-powder scent Stay Matte has, but aside from that it is fantastic. Origins Ginzing Moisturiser-Having combination skin means that heavy, thicker moisturisers do more harm than good to my skin. It's no surprise that Ginzing moisturiser was popular then. I literally scraped away at my first pot until there was nothing left in it (!). This is lightweight yet super hydrating. The invigorating orange and coffee-bean formula revitalises lacklustre skin leaving you with a "healthy, vibrant glow". *Have you tried any of these products? 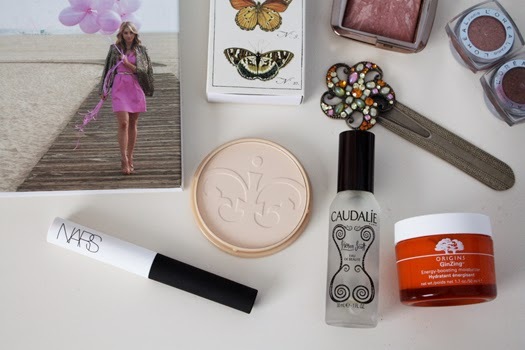 Which are your repurchase must-haves? Rimmel Stay Matte is an always repurchase for me too! Definitely will be repurchasing the Rimmel Stay Matte Pressed Powder when mine runs out! So good!